Time is used to mark significant moments and periods in Eddie’s life, as well as to show the fluidity between life and death. Time is always moving forward, and yet by telling the story in out-of-order episodes, Albom creates the sense that time is not necessarily linear—particularly from the point of view of eternity and heaven. In between stories of Eddie’s encounters with the five people in heaven, there are short snapshots from Eddie’s life. 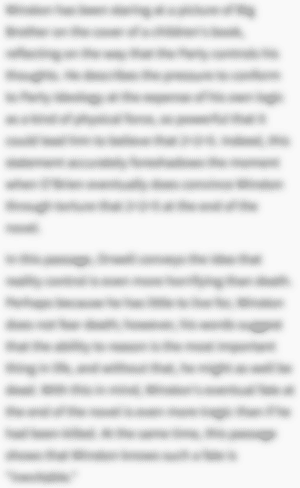 Beginning with his birth, each of these sections is titled: “Today is Eddie’s Birthday.” By marking Eddie’s birthdays in this way, the novel more clearly defines the changes in Eddie’s life as he moves through time. The final chapter then strings together all of Eddie’s birthdays after Marguerite’s death to show how after losing his wife, Eddie’s birthdays become increasingly lonely, and eventually he stops marking them at all. With all his loved ones gone, his life no longer feels differentiated, or worth taking note of as it progresses. Thus relationships appear to define time in some sense—without human connection, time becomes a more amorphous and incomprehensible. On earth (in the novel), there is the sense that time is always running out. The book begins by describing the hours before Eddie’s death at the amusement park. Each new section of the first chapter begins by stating how many more minutes Eddie has to live: “Sixteen minutes left to live, Eddie….” or “Fourteen minutes before his death.” When Eddie tries to save the little girl from the falling ride, he feels he is fighting against time, calculating minutes and seconds in his mind to see if he can make it. Yet in heaven, characters do not experience time. They wait for each other to join them in different parts of heaven without counting the time, and experiencing a kind of eternity—in which time is not linear, but exists all at once, similar to how Eddie is detached from time after death and can perceive the arc of his life as a whole. Without aging, night, day, or an external rhythm (no place to “be”), the characters experience their existence through memories and emotions in a dreamlike state. At the end of his journey through heaven, Eddie himself enters into this state, and eventually gets the endless time with Marguerite that he has always wanted. The ThemeTracker below shows where, and to what degree, the theme of Time appears in each chapter of The Five People You Meet in Heaven. Click or tap on any chapter to read its Summary & Analysis. 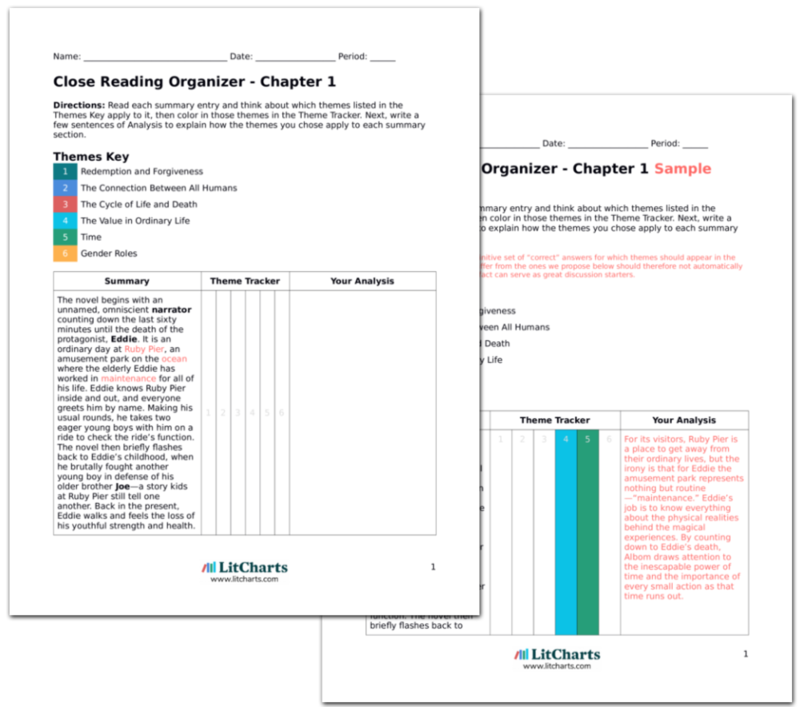 Get the entire Five People LitChart as a printable PDF. 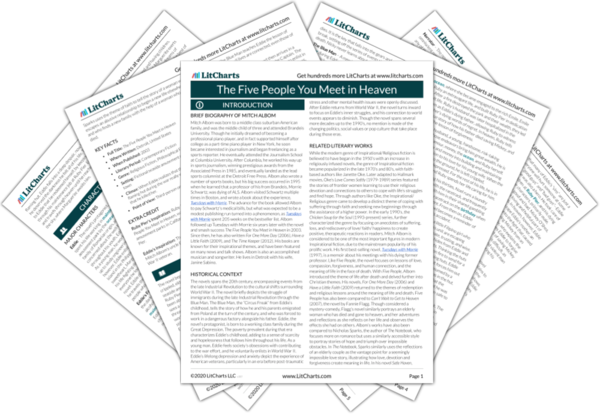 Below you will find the important quotes in The Five People You Meet in Heaven related to the theme of Time. 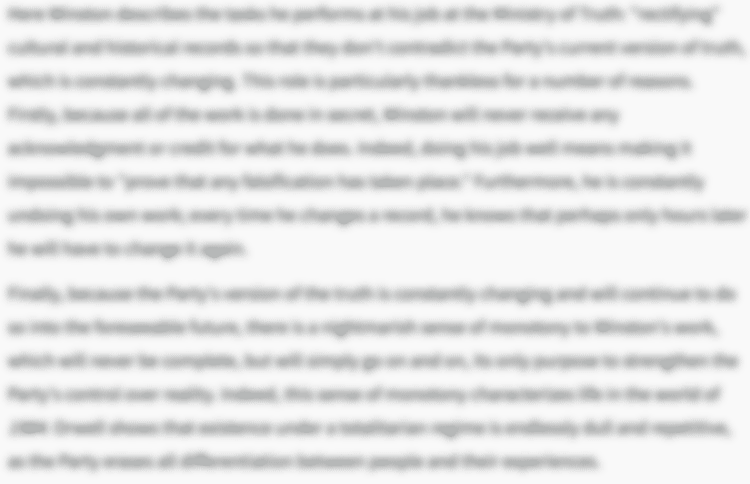 Unlock explanations and citation info for this and every other The Five People You Meet in Heaven quote. As always with Marguerite, Eddie mostly wants to freeze time. Adam’s first night on earth? (…) He doesn’t know what sleep is. His eyes are closing and he thinks he’s leaving this world, right? Only he isn’t. He wakes up the next morning and he has a fresh new world to work with. But he has something else, too. He has his yesterday (…) That’s what heaven is. You get to make sense of your yesterdays. He was nothing now, a leaf in the water, and she pulled him gently, through shadow and light, through shades of blue and ivory and lemon and black, and he realized all these colors, all along, were the emotions of his life. Ballinger-Dix, Elizabeth. "The Five People You Meet in Heaven Themes: Time." LitCharts. LitCharts LLC, 8 Jan 2016. Web. 23 Apr 2019. Ballinger-Dix, Elizabeth. 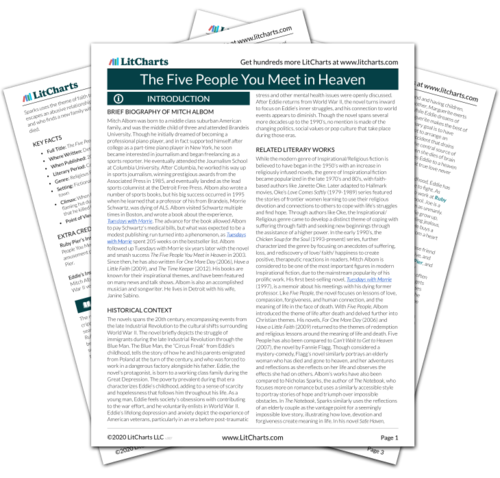 "The Five People You Meet in Heaven Themes: Time." LitCharts LLC, January 8, 2016. Retrieved April 23, 2019. https://www.litcharts.com/lit/the-five-people-you-meet-in-heaven/themes/time.